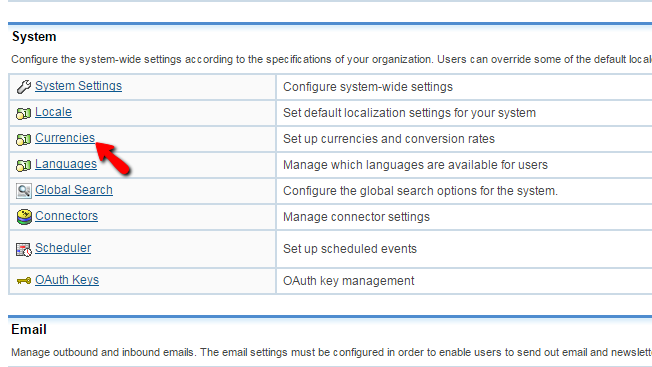 Most of the aspects of your SugarCRM instance will require the management of different currencies. For example if you have a business worldwide then you will need to configure different currencies for the different countries. SugarCRM provides you with a whole separated section in its admin area where you will be able to configure and manage your currencies and in the next few lines of this tutorial we will show you how to do that. In order to manage the Currencies of your SugarCRM instance you will need to first login into the application and from the main screen you will need to click on the Admin link so you can access the admin area of the application. 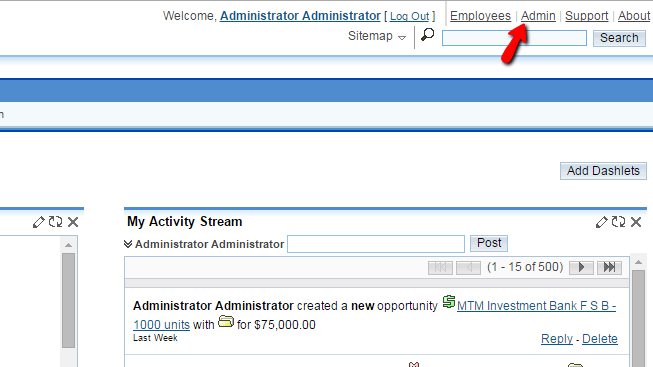 Once you are into the admin area you will need to find the Currencies link which is under the System section of settings. Then if you click on that link you will be directed to a separate page precisely for the management of the currencies on your SugarCRM instance. Currency Name - The actual name of your currency. Currency Rate - The rate this currency should be exchanged based on the default currency. Status - If this currency should be active or not. ISO4217 Code - The code of the currency which can be obtained from the Wikipedia Page for these codes. Currency Symbol - The symbol of the currency you are adding. You should have that on your keyboard or you can copy/paste it from somewhere around the web. Once you are done with these configurations please click on the Save button and the new currency will be displayed immediately after in the table above this section. In order to edit a currency you have already added you will need to first find the currency in the table of currencies. Once you do that you will notice that the name of the currency is an actual link. If you click on that link the currency will be loaded in the Edit section below. Then you will notice how all the above described fields which you have used to add a currency will be filled with the information for the currency you are editing. Please edit the configuration and when you are ready please click on the Save button so you can save it. The last Currency management activity you can perform is to delete a currency. This is also relatively easy once you find the currency you would like to delete in the table of currencies. Simply clicking on the Delete link in the right side of the table next to every currency will cause a currency to be deleted. Congratulations! 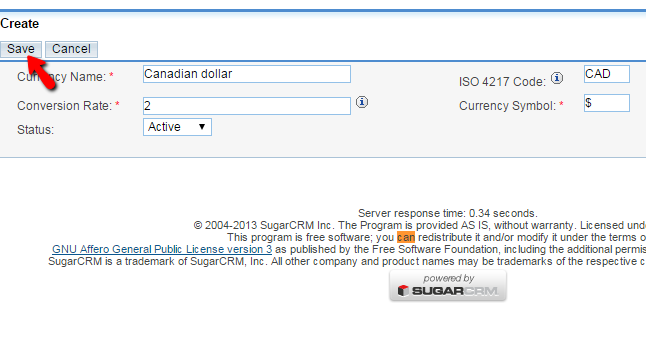 You now know how to fully manage the currencies on your SugarCRM based website!